This block represents a perfect opportunity to secure a smaller forestry holding in the Taranaki region. The forest has a total area of 477ha comprising 85ha of younger age class Radiata pine and 186ha of Redwoods. The current owners have decided to retain the 186ha of Redwood crop and sell the land from underneath it. Therefore offering an astute purchaser a unique opportunity to acquire 477ha of forestry land, 85ha of Radiata pine crop and a rental income on the land underneath the 186ha of Redwood crop. located just 45km from Port Taranaki making this a great investment opportunity. Call today to get a full information memorandum. Colliers International is excited to bring to the market the Timber No. 1 Estate formed from 4 freehold forests located across the Southland (2), Gisborne (1) and Waikato (1) regions. The Estate has a gross area of 4,018ha and a net stocked area of 2,627ha comprising primarily Radiata pine. The combination of professional management under predominantly a clear wood regime and approximately 70% of the estate established prior to 2000, will ensure significant wood flow in the near future for the successful purchaser. There is an additional carbon earning benefit that comes with the estate with a total of 2,464 ha of post 89 land already registered in the emission trading scheme. The Timber No. 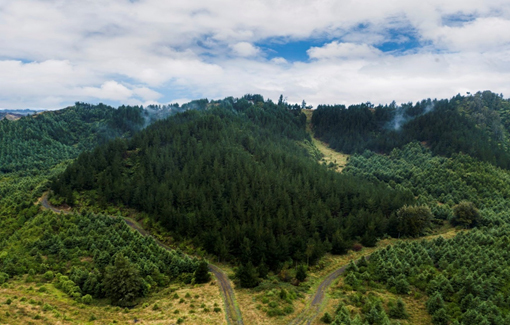 1 Estate provides a rare opportunity to secure a cornerstone holding in the NZ forestry market! With locations that offer access to both quality domestic processors and efficient export log ports, this is a superb opportunity to own an exceptional estate in well-established forestry regions. The estate is available for sale in its entirety or per individual region. Call today to obtain the detailed Information Memorandum. Wairakei Estate is an outstandinga gricultural land holding in excess of 25,000ha located near Reporoa, North East of Lake Taupo in the Central North Island of New Zealand. The Estate is privately owned with an intergenerational vision to adopt an industry leading mix of sustainable land uses. Following considered master planning, some 7,326ha has been set aside for production forestry. Offered for sale by CBRE Agribusiness is a single rotation Forestry Right comprising some 3,506ha of established young age class crop (together with 286ha being established this winter), together with the opportunity to plant 2,201ha that will be available as cutover land as existing forestry rights terminate and a further 1,334ha currently utilised for drystock grazing which will shortly be available for forestry. Being offered by way of Two Stage Expression of Interest, with Stage One closing Thursday 23 May 4pm NZST.